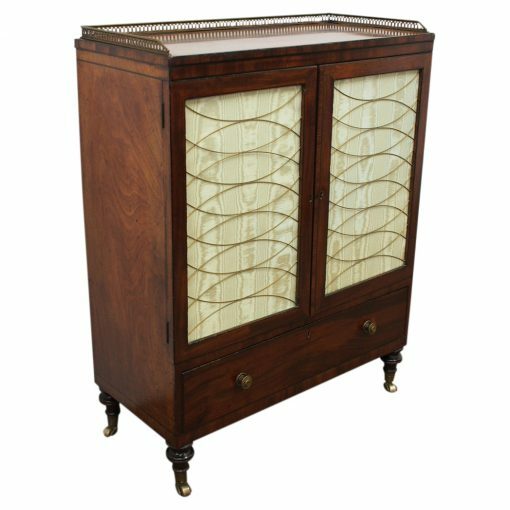 Circa 1811, Regency, neat-sized inlaid mahogany cabinet. 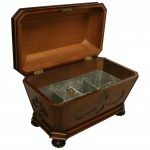 The rectangular top with a three quarter, open fret brass gallery in figured mahogany with double ebony inlaid fore-edge. It has twin inlaid doors with a brass grill and pale green water silk backing. The cupboard has an adjustable shelf above an inlaid drawer with original brass handles, and it is all on neat turned feet with brass castors.